This layout divides one binary number held in input register A, by the number held in register B, and outputs the result in register S. The calculation is performed by a series of subtractions. Register S counts the number of subtractions before register A 'underflows'. Accumulator function, to subtract B from A. Count Up function to increment S.
Clear register S. Enter binary values for A and B (eg 14/3) and start the train from the station. When the train returns and halts, the result of A/B can be read from the output register S.
If the result of A / B exceeds 31, register S overflows and the train returns to the lower station platform as an error. This should not happen unless dividing by zero, or register S was not cleared before calculation commenced. Register B is checked first. If it is greater than A, then A will 'underflow'. 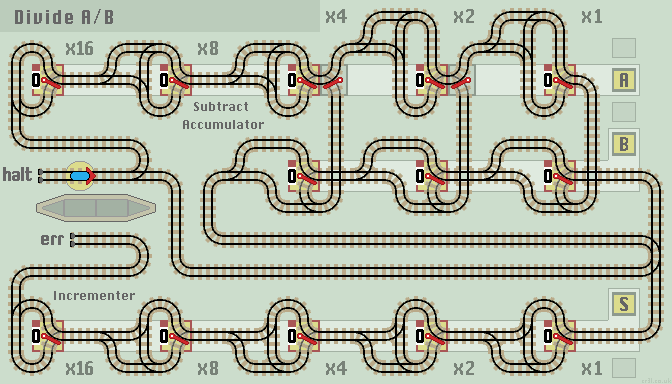 The train returns to the station and the calculation halts, showing 0. The original value of A is 'lost' as B is subtracted from it. A Copy function can be added to preserve the initial value of A. The remainder value is also lost. Again, a Copy function can be added to preserve the remainder value if required. This layout is almost a vertical reflection of the previous Multiplier function, (with two more stages added to register A). In the Multiplier, the Count Down function is checked first, in case it is zero. Here, the Accumulator is checked first, in case it is larger than A causing an 'underflow' and halting the calculation. The layout works correctly when dividing by zero, eventually causing register S to overflow. Its not very elegant though. 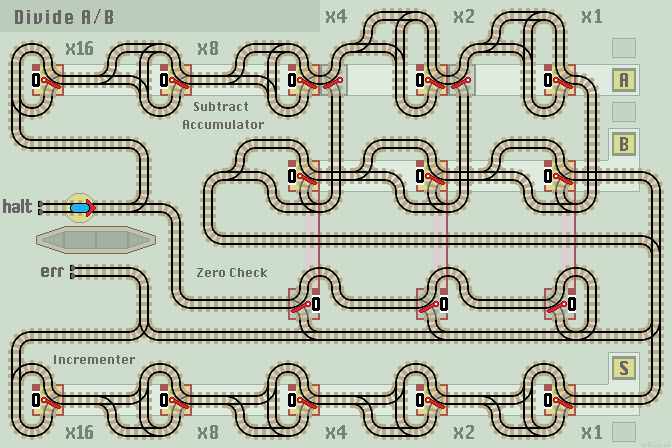 In the layout below, I've dropped in a Zero Check function, which stops the calculation with an error if B is zero. See Divider using a shift function for a more efiicient design.